Love My Maps? I love „your maps“ 😉 but besides the excitement of announcements, such as the one about adding editing functionality to the Google Maps API, which was made on the Official Google Maps API Blog this morning, some kind of frustration also comes along with it. Why? How many developers do you think are solving the same problems again and again? We have come to know Google as a company, which does not like to let people know too much about what’s next. Fair enough you may say – maybe you have to stick to these rules for surviving in a market, which is increasingly showing signs and giving rise to speculations about becoming disrupted or changing from a blue ocean to a red ocean or for the Google supertanker. I guess Google really has transformed into a supertanker in the last few years. By the way, the addition of editing functionality to the Google Maps API was just one of several „new Google Maps things“ in the last week. We have now got a Google Map Flash API, new user functions and content to explore and discover the world around and far away 😉 or the new real estate options. So why is there also frustration besides the excitement? While some people certainly like to „prototype-(p)re-invent“ wheels, others specifically DO NOT like to. Especially for smaller businesses, which use Google Maps or Google Maps Enterprise as a tool for making some kind of business idea work, it can be really frustrating to spend time and resources on developments that can literally often go in the bin a few weeks later – when the exact announcement that you were waiting for some weeks ago, is finally made. For those, who even just intend to use Google Maps as a platform to realise their new mashup idea, planning ahead is extremely difficult. Do you want to spend a few weeks or months developing some fancy new feature, which is not available on Google Maps yet, or not exposed in the API just yet – and then find exactly that feature being added after you have engineered it yourself? If you are still working on it, you may save yourself some night shifts and this might bring at least some excitement besides the frustration that you have just wasted a lot of valuable time on inventing a wheel which is now given away to anyone for free! Or go and risk it – you may become famous in the visionary or technology enthusiasts departments and communities for a few days, and if you are quick and successful in crossing the chasm, you may become even more famous and rich – or you may end up at the bottom of the crevasse – with all the others that vanish in the awesomeness icefall. 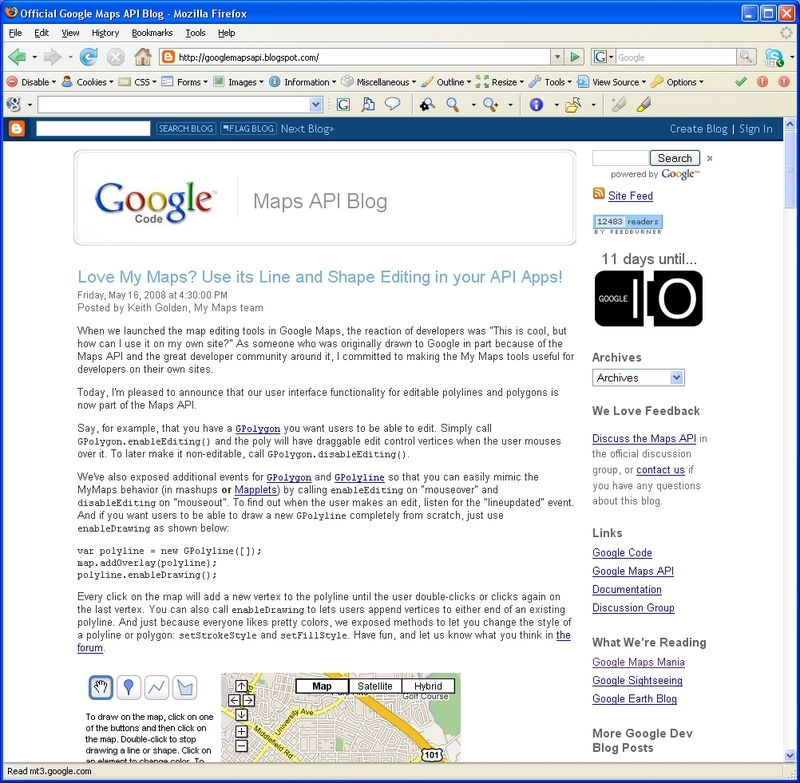 I’ll give you an example: Google released a static maps API earlier this year. Then, a little later, Google added support for more marker options and paths on the static maps along with the message that lines can only contain 50 vertice points. Now if you need a hundred? Draw two lines? Should be an OK hack. If you need 1000 – hmm, how about building something yourself. Sophisticated server-side solution? Enough tools out there to do something like that… Or wait until Google decides that lines can be longer now? You decide! Good luck – and be sure to not be frustrated, but excited instead, if things keep changing… you know! If you want a bit more planning, and you can afford to do without a substantial set of free geodata, then you may answer the question, „must it always be Google Maps?“ with a clear „no“! For example, follow the Open Layers Blog and you have a pretty good idea about what will be next – in fact, you can even contribute to make it happen faster! Excitement and frustration are often very close together and timing is what may decide whether you will smile or get annoyed digesting your daily news. I’ll start my day going out for a run now – awesome nature is waiting for me! Dieser Beitrag wurde unter Google Maps abgelegt am 17.5.2008 von admin. Too many choices, too much content is a great brief article, which was recently published on ReadWriteWeb. The article offers a familiar perspective on (I guess) many people’s daily reading slot challenge. It also reminded me of an interesting book about what we all do on the Web these days. It is called The Cult of the Amateur and it offers a thought provoking perspective about the problem of filtering the useful from the not so useful content on the Web. Andrew Keen uses the metaphor of typewriting monkeys, to refer to the majority of content producers, who are responsible for the not so useful content, in which we all struggle to not drown day by day. Read about the infinite monkey theorem and you get a good idea about the message of the book. There’s also this little thing called „going outside“ that we would like to take part in, too. Hopefully we’ll see the killer web app to filter the noise someday soon to help us do so, but it’s definitely not here yet. Dieser Beitrag wurde unter Killer apps abgelegt am 16.5.2008 von admin. Dieser Beitrag wurde unter City abgelegt am 7.5.2008 von admin. Today, I read a blog post on folksonomy mapping on the United Maps Blog, which triggered me to think about how the geography of map use may relate to the geography of map making, especially with regard to projects such as Open Street Map. Are there patterns that may suggest that the most popular areas that people look at on Google Maps or Microsoft Virtual Earth are also the areas that are best mapped by folksonomy mappers worldwide? There is an interesting research paper (pdf) on hotmaps (more commonly known as heat maps these days, I guess) by Danyel Fisher, available from Microsoft Research. The paper provides insights into the geography of map use, for instance, with regard to a tourism context. The areas, in which map tiles are most frequently requested are the „hot“ or „heat“ areas. These places are often popular tourist attractions. I thought it would be interesting to overlap these heat maps or hotmaps with maps showing the degree of completion and coverage in the Open Street Map geodata. I haven’t really looked closely, whether someone may have already done this. If so, please let me know. Otherwise, maybe someone is keen for a mashup, maybe as a little research project in a geography or a GIS related course at university? I think it would be interesting to find out if there are distinct patterns. It seems obvious that an overlap will show that the big cities are most popular in terms of map access and also in terms of completion of coverage in Open Street Map. But what other patterns may be found? And how may they be explained? Dieser Beitrag wurde unter Geo abgelegt am 6.5.2008 von admin. Live Earth – See what I’m doing! To be honest. I haven’t tried Twitter yet. And I am not even sure why. Maybe I’ll have a closer look at some stage… maybe when it will turn into Live Earth. Sure, we’ve got webcams already. But don’t you think it would be exciting to have them mounted (excuse me) to people. Head mounted webcams already brings up three hits on Google. Of course there would be an option to switch them on and off. In „tourism“, things have proceeded from exploration by a few explorers to travel by a few more to tourism by many more – and from looking to experiencing… Parallels on the Web?!? Don’t you think this will happen with Twitter as well? Maybe YouTube becomes boring one day – because it is old hat – stuff that happened in the past and people are more excited to know what is happening right now. Too much stumbling already for today? How about enjoying someone ski down a fresh powder slope – live – in real time! Just need to upgrade some of those helmet cameras … In addition to real time satellite imagery, the social part of live earth will complete ground-truthing in real-time. Dieser Beitrag wurde unter Live Earth abgelegt am 1.5.2008 von admin.